Hasan Minhaj: Homecoming King is a 2017 American stand-up comedy film written by and starring Hasan Minhaj. It is his first stand-up special and premiered on Netflix on May 23, 2017. Filmed in his hometown of Davis, California, Homecoming King focuses on Minhaj's experience growing up in an Indian American Muslim family, which he calls "The New Brown America." Homecoming King was critically acclaimed, with Minhaj in particular praised for his storytelling, weaving together the humor and heartbreak of his life. The special was honored with a Peabody Award in 2018. Illustrated with old photos and peppered with Hindi and Urdu phrases, Homecoming King features a central theme of the immigrant experience in the United States, based on true stories from Minhaj's life as the California-born son of Indian Muslim immigrant parents. He discusses his childhood growing up in mostly white Davis, California, where he lived alone with his dad for eight years while his mother was finishing medical school in India. He talks about the pressures of being the child of demanding immigrant parents while at the same time experiencing racism, bullying and rejection from the outside world. Stories include his mother returning to California with a younger sister he didn't know existed, his family receiving threats and harassment after 9/11, his heartbreaking senior prom night (when he went to pick up his date only to discover her parents had found her a white boy to take because of "how it would look"), and disapproval from his parents that he was engaged to a Hindu woman. Homecoming King was filmed January 27, 2017, at the Mondavi Center at Minhaj's alma mater, the University of California, Davis, in his hometown of Davis. He first created the one-man show after being selected by the Sundance Institute's New Frontier Story Lab in 2014. He performed the set at the 2015 Just for Laughs Festival in Montreal before his off-Broadway premiere in October 2015 at the Cherry Lane Theatre in New York City, where it ran for four weeks. He went on to perform the show in more than 40 cities before shooting the special. Minhaj chose the title Homecoming King to reflect his status as the high school underdog who never went to football games or dances, while also conveying a message of redemption as an adult. The art director for the show was Sam Spratt, who created multiple paintings depicting Minhaj's life in the style of Norman Rockwell for posters and the website. The stage set contained bright yellows and oranges to reflect Indian culture. Minhaj also teamed up with Swedish composer Ludwig Göransson for the musical elements of the show. Homecoming King has received critical acclaim, in particular for Minhaj's ability to engage with both humor and sadness. Dennis Perkins of The A.V. Club graded it an A, writing: "One of Homecoming King's chief pleasures is how expertly Minhaj crafts these anecdotes—his mother’s return, a prom-night revelation, a family trauma, his Daily Show audition—his confident, energetic flow not so much disguising the craft as relishing in the telling, and in the effect it has on his rapt audience." Stav Ziv of Newsweek writes, "In Homecoming King, Minhaj navigates adeptly between humorous and heartfelt, playful and poignant." Scott Meslow of GQ wrote, "It's been ages since I've seen a comedy special I admired and enjoyed as much as Hasan Minhaj's Homecoming King... Homecoming King sheds light on a different, more personal side of Minhaj's talents, [weaving] a funny, heartbreaking, and intimate narrative built around his most personal experiences." Lea Palmieri of Decider.com noted Minhaj's skill in relaying the stories of his life, including the painful ones: "Maybe the most impressive aspect of Minhaj's show is how exquisitely he's balanced and timed out his ratios of belly laughs to gut punches. As soon as tears drip down your face from giggling too hard, they're immediately chased by ones caused purely by emotions. Minhaj has crafted his biography into a stage show that is supremely touching, all too real, and way funnier than anything the rest of us have to offer." Homecoming King was honored with a 2018 Peabody Award for being a "deeply personal memoir — part Richard Pryor, part Spaulding Gray — that covers the struggles of the immigrant experience, encounters with stereotypes and raced expectations, and intergenerational acceptance, while using comedy to invite empathy, caring, and understanding." 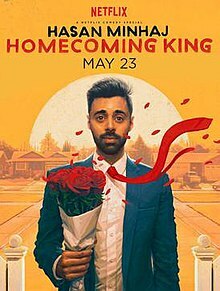 ^ a b "Hasan Minhaj's 'Homecoming King' Is an American Story, Whether You Get the References or Not". Splitsider. May 23, 2017. Retrieved May 24, 2017. ^ a b c Meslow, Scott (May 11, 2017). "Hasan Minhaj Still Thinks We'll Survive Donald Trump". GQ. Retrieved May 23, 2017. ^ Petski, Denise (January 28, 2017). "'The Daily Show's Hasan Minhaj Gets Netflix Comedy Special". Deadline Hollywood. Retrieved May 23, 2017. ^ Rathore, Reena (April 26, 2018). "Comedian Hasan Minhaj's Debut Netflix Special Lands Him His First Peabody Award". India West. Retrieved August 1, 2018. ^ Desta, Yohana (May 17, 2017). "Hasan Minhaj Had a Roast Ready in Case Trump Showed Up to the White House Correspondents' Dinner". Vanity Fair. Retrieved May 23, 2017. ^ Meyer, Carla (January 20, 2017). "Hasan Minhaj of 'Daily Show' back in Davis for Netflix special". The Sacramento Bee. Retrieved May 23, 2017. ^ Ternus-Bellamy, Anne (October 6, 2015). "Take it from this Davis guy: Life gets better". Davis Enterprise. Retrieved May 24, 2017. ^ Waraich, Sonia (July 21, 2015). "'The Daily Show' Correspondent Hasan Minhaj Premieres Off-Broadway Show". India West. Retrieved May 23, 2017. ^ Schultz, Jon (May 23, 2017). "Davis' Hasan Minhaj debuts on Netflix: Early reviews crown 'Homecoming King'". The Sacramento Bee. Retrieved May 23, 2017. ^ Arora, Priya (November 6, 2015). "Comedian Hasan Minhaj on 'Homecoming King' and the Power of Storytelling". India.com. Retrieved May 24, 2017. ^ Tabrys, Jason (May 23, 2017). "Hasan Minhaj On Snark And Starting Relatable Conversations About Race". UPROXX. Retrieved May 24, 2017. ^ "Sam Spratt on Twitter". Twitter. May 23, 2017. Retrieved May 24, 2017. ^ "Hasan Minhaj [returns] talks about his White House Correspondents' Dinner speech | ep. 24". the apartment with asif and baluch. May 15, 2017. Retrieved May 31, 2017. ^ Perkins, Dennis (May 23, 2017). "The Daily Show's Hasan Minhaj crafts a hilarious, spellbinding immigrant story". The A.V. Club. Retrieved May 23, 2017. ^ Ziv, Stav (May 23, 2017). "Hasan Minhaj on being called "the color of poop" and other stories about growing up a Muslim Indian-American". Newsweek. Retrieved May 24, 2017. ^ Palmieri, Lea (May 23, 2017). "Skip Your Prom And Watch 'Hasan Minhaj: Homecoming King' Instead". Decider.com. Retrieved May 23, 2017. ^ "Hasan Minhaj: Homecoming King". Peabody Awards. Retrieved April 20, 2018. This page was last edited on 9 December 2018, at 05:02 (UTC).